Dr. Victoria Henry (Process Technology program director); Dr. David Hall; Process Technology students Deshaun Garvey, Warren Graham, Mahlana Graham, and Michael Williams (obscured behind Mr. Graham is Ferdinand DeCambra); Fiona Jones, Vice President – Operations, Diageo USVI; Dr. Michelle Peterson (Associate Dean of UVI’s College of Science and Mathematics);and Erica J. Johnson (Director, Corporate and Community Relations, Diageo USVI). 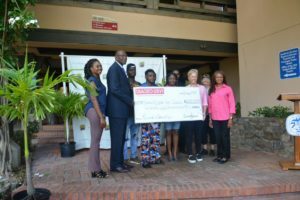 Diageo, owner of the Captain Morgan rum distillery on St. Croix, donated $250,000 in support of the University of the Virgin Islands Process Technology program in the College of Science and Mathematics. The money will be used for scholarships and to support research in the areas of energy and water management, according to UVI. The university hopes the research will produce valuable information and lead to actions the U.S. Virgin Islands can take, especially when major disasters strike. “This support from Diageo is not a one-off; it represents the latest in a series of investments by Diageo in our Process Technology program. It also symbolizes the type of partnerships with industry that UVI needs to reach our full potential,” UVI President David Hall said in a statement from the university. — Employ two students as Captain Morgan Fellows who will work in the simulation lab on innovative energy and water management projects to enhance their experience and research skills. — Provide renewable academic scholarships to assist in retention and recruitment efforts of students across the territory and throughout the Eastern Caribbean region. UVI Vice President of Institutional Advancement Mitchell Neaves introduces guests and speakers at the check presentation in front of the Melvin Evans Center, Albert A. Sheen Campus, St. Croix, USVI. “Investment in UVI by Diageo is helping to sustain and grow our program in notably new ways,” Process Technology Program Director Victoria Henry said. “Following the 2017 hurricane season, we wanted to make an investment in recovery efforts that could have a long-term positive impact on important institutions and on the community at large, We think the work that will be done at UVI with the grant will accomplish both. 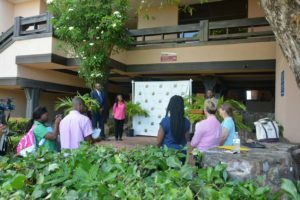 We look forward to seeing the students thrive and the ideas they will produce through their energy and water management research studies,” said Erica J. Johnson, director of Corporate and Community Relations at Diageo USVI. This $250,000 gift to UVI is part of Diageo’s commitment of $1 million in support of long-term recovery efforts following the disastrous 2017 hurricane season. Other funds were donated to the Community Foundation for the Virgin Islands and efforts led by Tim Duncan, who worked to provide relief supplies in the immediate aftermath of Hurricanes Irma and Maria. Diageo’s previous support for UVI’s Process Technology program was in the form of a $150,000 grant over three years to establish a process simulation lab with new modules that include a range of alcohol beverage industry applications.